Please speak out for the Bosnian bears! For many years now a large number of wild animals have lived under illegal and completely inhumane and inadequate conditions where they are being kept as an attraction and marketing tool for restaurants and other catering establishments or in private zoos. They all ended up in the hands of their current “owners” thanks to insensitive hunters who killed their mothers. 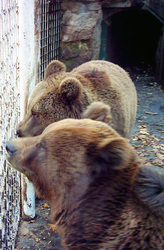 Two bears, who have spent their entire life in small cages, under terrible conditions, are going to be put down by decision of Bosnia & Herzegovina's Ministry of Agriculture, Water-Management and Forestry. Actually, the same fate expects all 10 captive bears, known in the territory of Bosnia and Herzegovina.